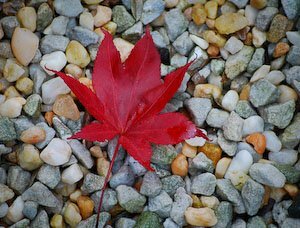 Sitting in a lawn chair on a river’s edge, I looked down and noticed a small, red leaf—alone, resting on jagged pebbles. I couldn’t take my eyes from it. Radiant, it lay dying. It was that beauty and death intermingled that captured my attention. I had spent the past year living with the reality of the death of my husband, John. We were living in Thailand at the time, working with a Mennonite organization. John worked with an economic development program, an AIDs patient program, and in leadership development, and I worked in leadership development and taught English. We had been married four and a half years and had an eighteen-month-old son. On Sunday morning, July 25, John was riding a motorcycle out to a church meeting in the village when he was hit head-on by a drunk driver—killed instantly. Uprooted, my son and I returned to North America. Having passed the first year in shock and anger, I now found myself inexplicably drawn to this lone, red leaf. I had my compact digital camera with me to get photos of the children playing in the river. I was not a photographer. I only used a camera to document the usual events of life—the cuteness of kids and interesting sights. But unwilling to leave the message of the leaf behind, I picked up my camera and snapped a photo. Thus began my quest to uncover images in the natural world that speak to the human experience. Within these images, I find meaning that connects with my own personal journey of grief and healing. I am continually amazed at how beauty and death so frequently dwell side by side. Still, I want to remember that nature is more than just the metaphor that I may find in it. I cannot just read my experiences into it and walk away, thinking that I have gained all it has to offer. Thus the photographs are presented without explanation. The poems alongside the photos may hint at a meaning, but my intent is not to limit the beauty and complexity of nature to what I need it to be for me. However, all art must to some degree place limits and interpretations on the subject. My choice of frame and focus speaks to the metaphor that I myself bring to the image. Another photographer of the same scene might try different angles and different focal points, writing her own story into the image. Hence these are not images of nature as it is—no photo could be. But the images are shaped by the pain, fears, hopes, and joys that I carry with me as I walk in the world. During this season of grief, I was also doing graduate work, taking several classes in the area of trauma healing. Our instructor invited us to explore our experiences and emotions by using different writing exercises to give expression to our stories. I never thought of myself as a poet, just as I never considered myself a photographer. I couldn’t remember the last time I had written a poem before John died. Yet, I needed to find a way to express my journey. Three summers after John died, I had scheduled a free week to work on an academic paper. However, when I sat down to write, all that wanted to come out was poetry. My sister-in-law wisely advised me to “go with the energy.” That week, I must have written twenty poems describing various events and emotions from my grief journey. Looking back, I see that that week was a turning point for me in the healing process. Getting the events and emotions outside of myself and named on paper freed me to explore more of what my life had to offer. I have discovered that poetry is good medicine, even for those who never imagined they would write it. For me, it was a matter of listening to myself—to the thoughts and emotions that stirred around in my mind and soul—and letting them have an avenue to come out into the light. Although written in the present tense, most of the poems were created two years after the events took place. It is as if I carried those memories and emotions frozen in my body until I was able to examine them by writing these poems. The writing helped me give language to events that seemed beyond description. I experimented with words until I found the ones that helped me understand and tell my story. Eventually, I began to notice similar themes in my poetry and photography. I started to put them together and found that they complemented each other, each contributing to a fuller expression of my journey. Though these poems and photos are an expression of a journey through grief, my hope is that they will be meaningful to people in all seasons of life. Loss is something we all face, and I hope that you will be encouraged to find your own way to give expression to your journey as you read mine. Read more about seasons of Solace here.